Friends, I am so excited to share with you the first big room reveal in our new home! Every room needed a little (or, let's be real, a lot) of love and attention, so choosing which room to really rip apart and put back together first took some time. But after a few weeks of working in a hot pink office after we moved in, I knew just where I wanted to start. In looking at all that we’ve changed since moving in last year, our shared office has been one of the biggest transformations in our home. I am much happier now to spend time each day in a room that is so calming. I feel more productive in my work and I love feeling like everything has a place again. 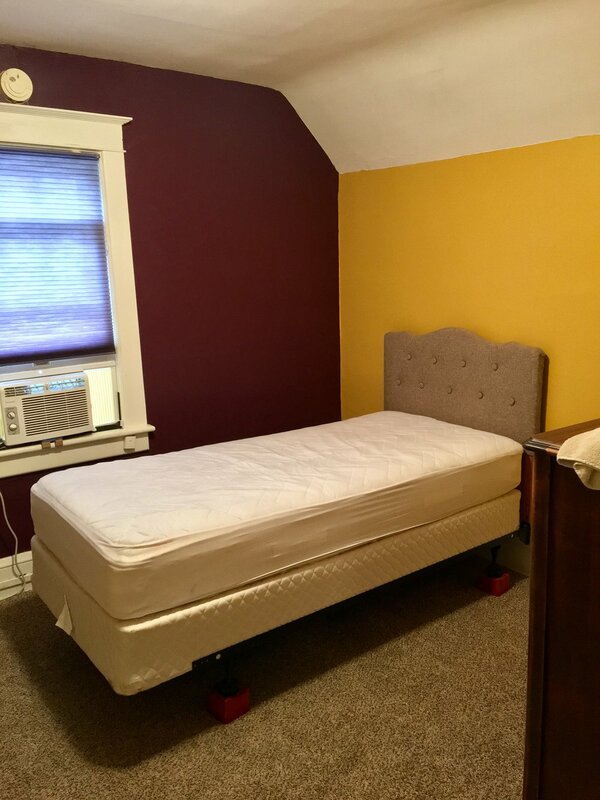 In making the decision to renovate the office, we also made the decision to change its location, flip flopping it with the bedroom we had originally designated as the guest room. A year later I’m still really happy with that decision - the natural light is better and because it's the smallest of the bedrooms, there isn't as much room for unnecessary clutter! It needed to have a good amount of storage space. It needed to be configured in such a way to designate two distinct work spaces. 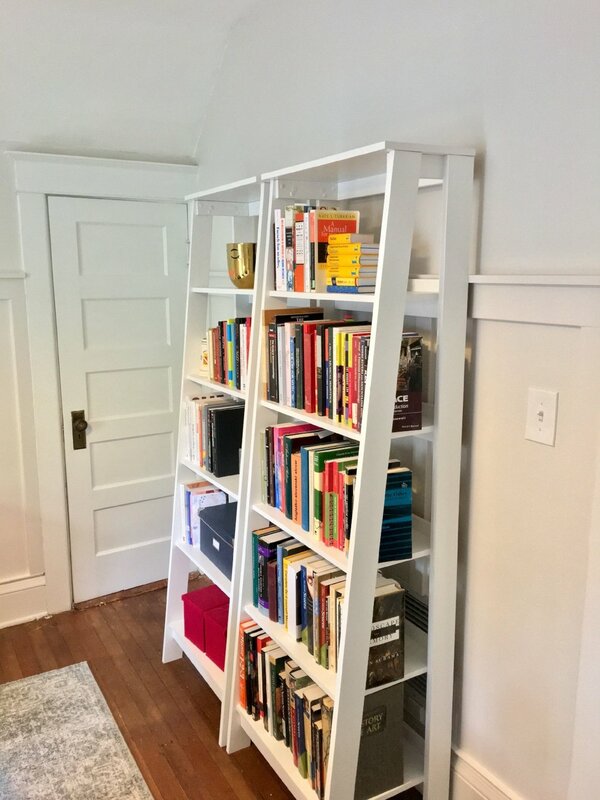 We wanted to use as much existing furniture as we could and be really intentional with any new purchases so that they would allow us to change things up in the future if we wanted to. 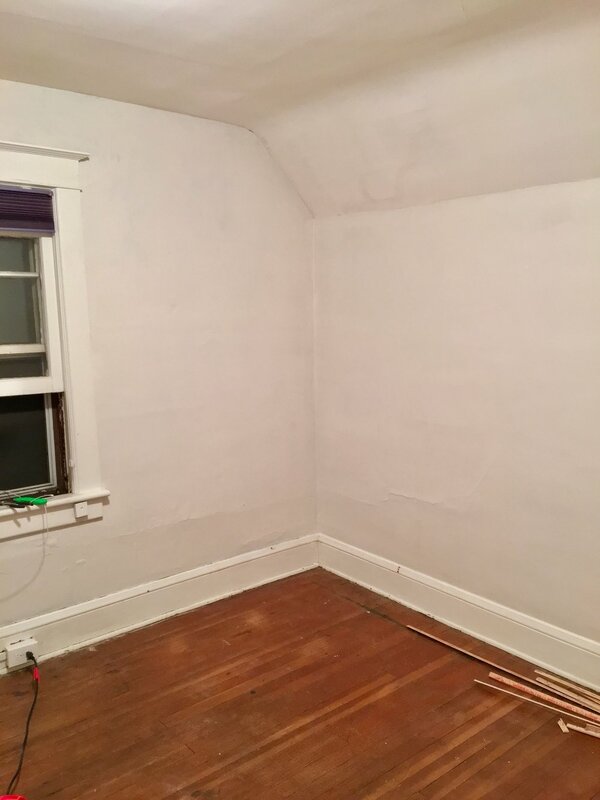 To be totally honest with you, after we got the first coat of paint on the walls, I was really doubting our choice. 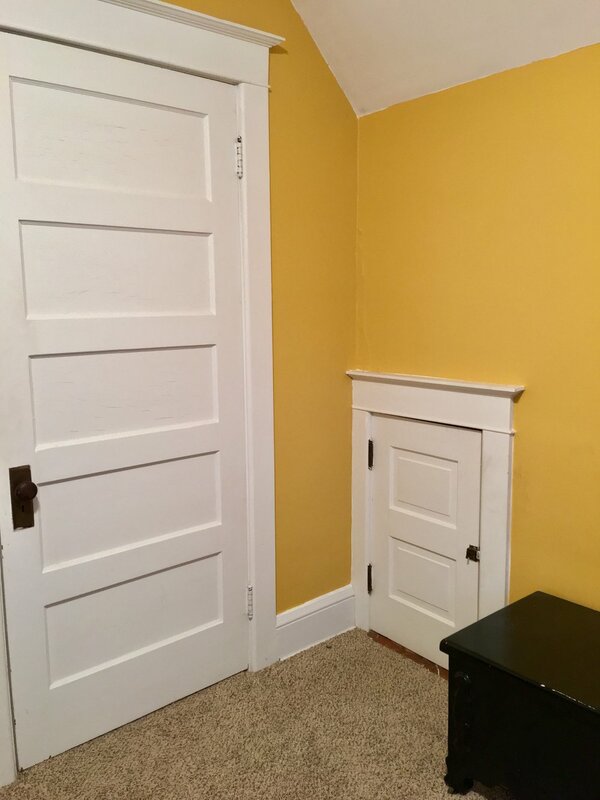 Between the creamy off-white wall color and the beige carpeting, the whole room looked really boring and one-note. And after we painted the second coat of paint on the walls that boring feeling only intensified! 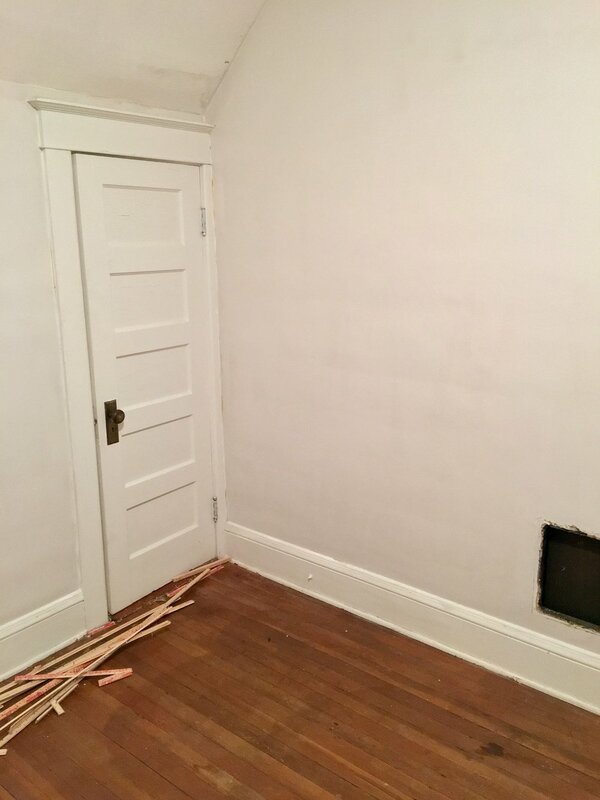 But one of the reasons I loved this house when we first looked at it was that it had hardwood floors underneath all this carpeting on the second floor. So late at night after the paint was dry, we tried ripping up a corner of the carpeting to see if exposing the hardwood floors would help our situation, and it was a huge success! This room ended up being a great way for Kurt and I to practice a number of new skills that we have continued to use as we’ve renovated the rest of our home too. 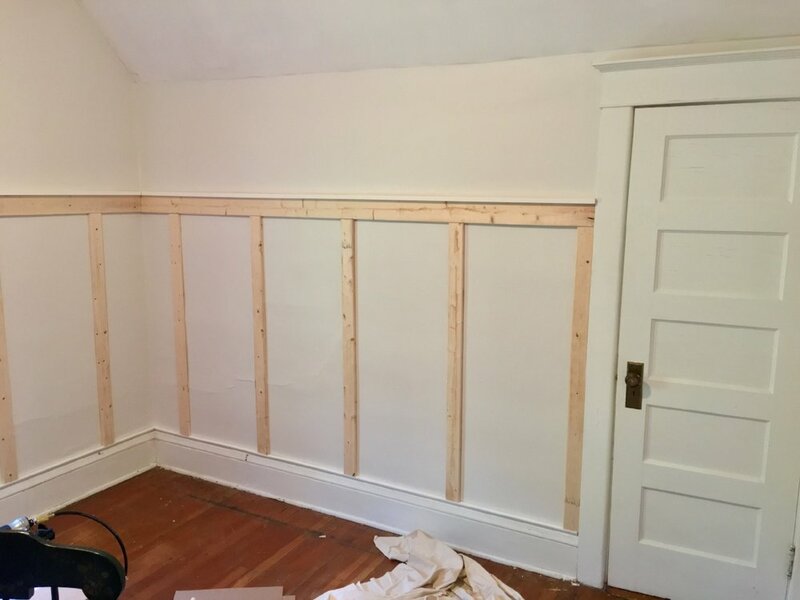 In addition to tearing out the carpeting and cleaning the hardwood floors that were hiding beneath, we also learned how to use a nail gun to hang the board and batten treatment on the walls, and how to install a new light fixture! 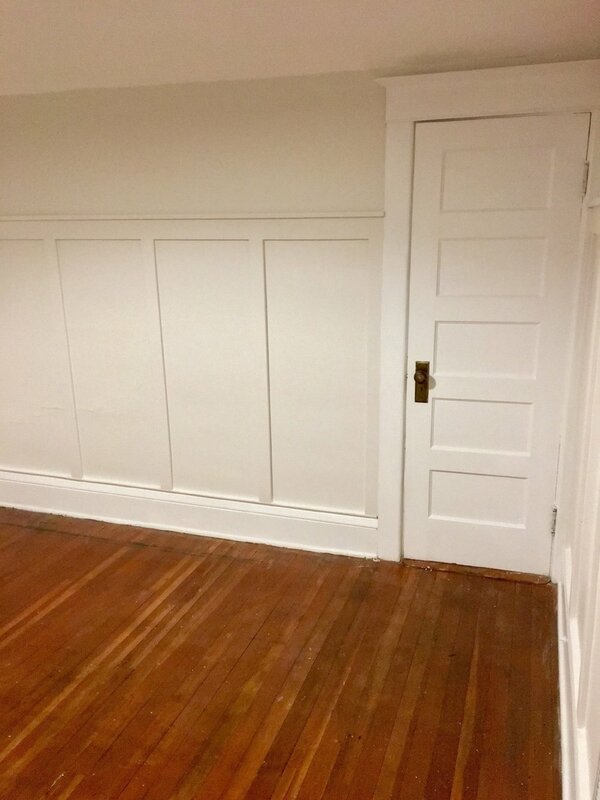 The final space that we ended up with is a room that meets all of our identified needs and then some! Each of us has their own space within the room complete with individual storage options. 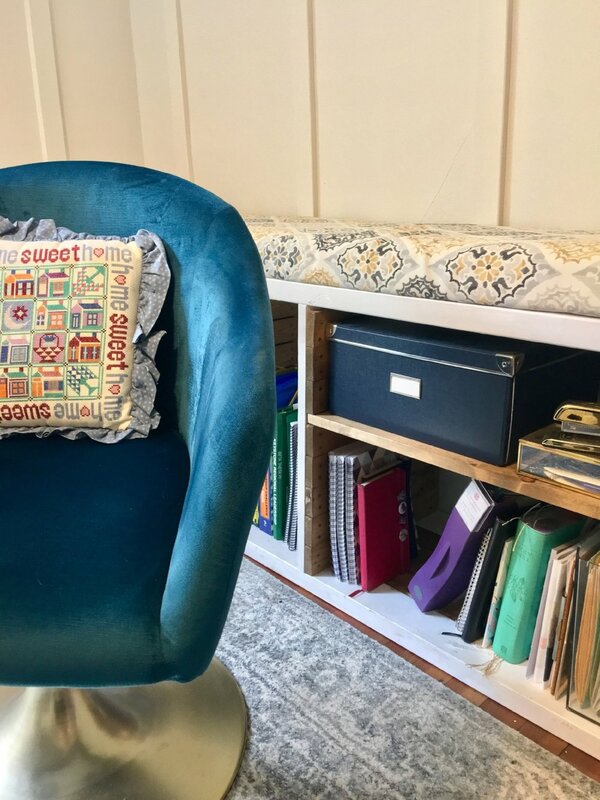 We were also able to use the office storage bench that we built for my office space in our Florida apartment. 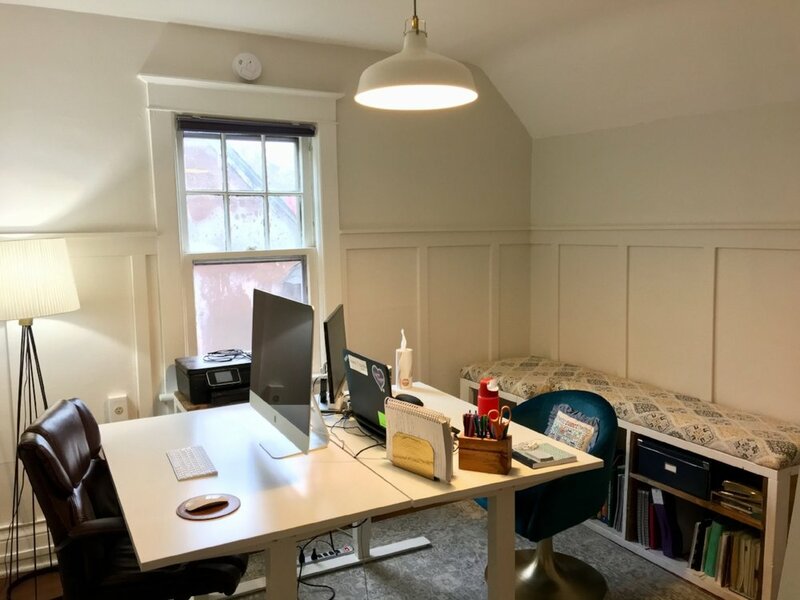 Being able to define my office space with that bench helped me to quickly feel really comfortable in the space because it immediately felt familiar. The furniture and decor items that we did purchase were the matching desks, the matching bookcases, the rug and the hanging pendant light. 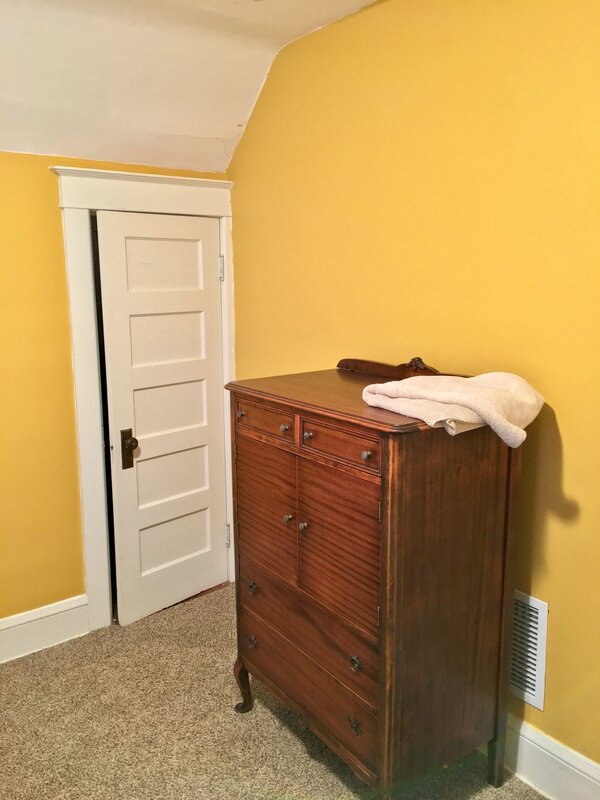 Because of their white and neutral color palette, we have almost endless options available to us if we ever choose to change up the paint color in the future. Even a year later when I come to work every morning, I am still sometimes amazed at the transformation of this room. I’m not sure I ever really knew how energizing it was going to be to have the opportunity to work in such a well designed space!